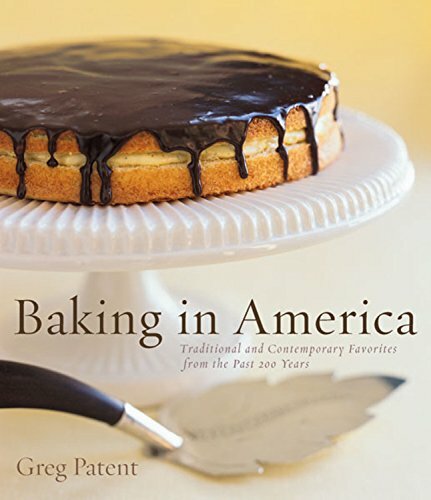 Over 200 years of history in the baking — the people, the stories, and, best of all, the recipes — are brought together brilliantly and for the first time in the eagerly anticipated Baking in America (Houghton Mifflin Company, November 2002) by Greg Patent. This volume has style and sustenance, with more than 250 traditional and contemporary recipes for every kind of sweet or savory baked good you can imagine: cookies, cakes, pies, tarts, doughnuts, pastries, muffins, quick breads and yeast breads and more. Oh my! Greg Patent began baking when he moved to this country as a boy at age eleven. So enamored with it, he entered a Pillsbury Bake-Off Junior contest, came in second place, and has been baking ever since. In Baking in America, Patent uses 1828 as his starting point, the year the first American baking book (Seventy-Five Receipts for Pastry, Cakes, and Sweetmeats by Eliza Leslie) was published. He scoured sources from across the country for exemplary baking recipes by and for home cooks. Perusing old cookbooks, journals, and handwritten diaries from libraries and private archives, Patent skillfully recreates treasured classics or uses them as inspiration for his own thoroughly up-to-date creations. He includes historical finds like the original Parker House rolls, Lindy’s Cheesecake, and a sensationally easy butterscotch cake that won a national baking contest in 1954. Baking in America also features contemporary standouts like the Malted Milk Chocolate Layer Cake, Blueberry–Lemon Curd Streusel Muffins, Peaches and Cream Cobbler, and Raised Potato Doughnuts. Starting with breads, once considered the foundation of a housewife’s baking repertoire during the early European settlement of our country, this book takes a close look at the evolution from savory to quick breads, biscuits to muffins. There are recipes as classic and varied as Southern Biscuits which are tender and flaky, and Texas Jalapeno Corn Bread which is moist and spicy. Sweet yeast breads and doughnuts are given plenty of ink and will have you hankering for irresistible treats like Cinnamon Raisin-Nut Crisps and Dutch Doughnuts (Olie Koechen), which the author touts as one of the best fried yeast things there is! Baking in America has chapters devoted to: Pound Cakes; Loaf Cakes and Sheet Cakes; Cupcakes and Cream Puffs; Layer Cakes; Sponge Cakes, Angel Food Cakes, and Chiffon Cakes; and Cheesecakes and Tortes. Each chapter contains the evolution of inventions that made baking simpler with the passage of time. In the mid-1800s, pound cakes were a big deal since you had to dry out the flour by the fire to remove excess moisture, but today with an electric mixer they are very easy to make and great to have on hand for company. Eliza Leslie’s Chocolate Cake is the earliest recipe for a chocolate cake that Patent found during his considerable research. He claims it is delicious plain, but with a scoop of vanilla ice cream even more so. The two-toned cakes like the Molasses Marble Loaf also date back to the mid-1800s. The Cupcakes and Cream Puffs chapter will make your mouth water. How good does Fudge-Filled White Cupcakes served slightly warm sound? Patent then moves on to the quintessential American creation: the layer cake — made possible by reliable ovens. Sponge cakes, angel food cakes, and chiffon cakes have one thing in magical thing in common: they puff to magnificent heights in the oven, rising to at least twice their volume. Then on to cheesecakes and tortes that often evolved into silky creations — spurred on in the 1920s when Breakstone began marketing cream cheese in a major way. Cookies, fruit desserts, pies, and tarts complete Patent’s culinary exploration of baking in America. He also provides useful guides to ingredients and equipment. So whether you feel like recreating a founding favorite or trying one of the author’s contemporary new creations, Baking in America is the most complete historical baking cookbook to date. History in the baking made easy and interesting by one of America’s great bakers!